The Bosnian War feels, in 2018, like something that happened a long time ago. A story collection centered around that conflict might not seem like the most relevant book to our current moment, at least not at first glance. And yet the peculiar history of the Balkans has resulted in a place where Christians and Muslims—Southern Slavs all, as a white as the current First Lady—live beside each other in varying states of friendship and aggression. The sectarian atrocities committed in Bosnia and Herzegovina from 1992 to 1995, and resultant Bosnian diaspora, do not fit easily with our contemporary American definitions of what a European looks like, or a Muslim, or a terrorist, or a refugee. 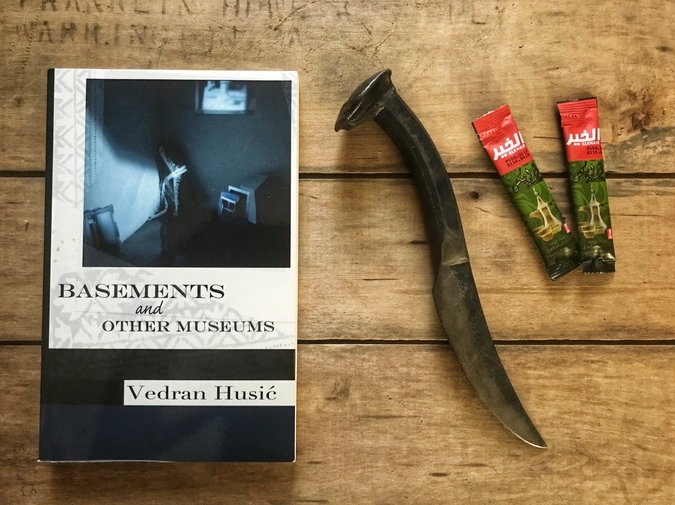 Vedran Husić, whose collection BASEMENTS AND OTHER MUSEUMSwas released this spring by Black Lawrence Press, was born in Bosnia and Herzegovina. His Muslim father was imprisoned during the War, and the family subsequently settled in the United States. The War and the Bosnian immigrant experience in America serve as the collection’s twin concerns, though the deeper history of the Balkans makes its presence felt in the pages. Probing issues of community, memory, and generational trauma, Husić’s characters seek answers in the documents that the vanished have left behind. Husić was kind enough to answer some of my questions about the book via email. How did this collection take shape? The stories are very much in conversation with one another. By the end, the book has become more than the sum of its parts. Did you go into this intending to create a cohesive, linked story collection? The majority of these stories were part of my MFA thesis, so the collection has a bit of the whiff of apprenticeship about it, though many of the stories had gone through serious revision in the five years between graduation and publication. I had to write about the war in Bosnia and Herzegovina and about the Bosnian immigrant experience. I also wanted to explore themes important to me such as the nature of memory, imagination, their interaction through art, themes that I found lent themselves to this need to write about events rooted in a certain historical experience. The specificity of that historical experience, along with the thematic focus, gives the collection a cohesiveness, which was my intention. Though, perhaps because these stories were my first attempt at writing, that intention felt less deliberate then than it does now in retrospect. The city of Mostar, in the Herzegovina region of the country of Bosnia and Herzegovina, serves as the epicenter of the book. Everything seems like it starts or ends in Mostar, near its famous destroyed-and-rebuilt Ottoman bridge. What’s your relationship to Mostar? That is definitely true; Mostar is the capital city of this collection, a blurred paradise for those characters who knew it before the war, and for the characters of a younger generation, who return to it only after the war. An environment that often feels more relevant, more resonant, as a place where somebody they loved has died rather than the place where they themselves were born. Though I was fortunate not to have anybody close to me die in the war, my relationship with the city is similar to that of the latter characters, seekers who feel Mostar to be a foreign landscape but also their rightful home, and who associate the city with feelings of both tenderness and great pain. How did you decide how much background to give regarding the history and politics of Bosnia? It’s a country that a lot American readers probably don’t know much about. I didn’t know much about it, at least. Did you worry about the explanation getting in the way of narrative? I tried to give only enough background as was necessary to follow the action of each story. Though, as I said above, the stories are rooted in a specific historical experience, they are not historical fictions. Because I was only six years old when the war began, I didn’t know too many details of the conflict myself and so relied mostly on my parents’ memories, the stories they and others would tell, and my own imagination to make the world of the book come to life. I didn’t try to overcompensate with too much research for the very reason you mention: overwhelming the narrative with ultimately purposeless exposition. Certain incidents or situations crop up several times in different stories. For example, “The Poet from Mostar,” “Translated from the Bosnian,” and “The Last Castle” all deal with Bosnian men imprisoned in a detention camp during the Bosnian War and the pain of their separation from their families. But in each story, the point of view is different. One is recounted by a Croat soldier, one is epistolary story written by a prisoner, one is from the perspective of a prisoner’s wife. What did you discover by moving the camera around like that? Every writer knows the rule of ‘write what you know,’ but the interesting thing is that you don’t really know what you know until you write it. Until you approximate through art the reality of a given event. My father was imprisoned in a detention camp for six months, and, being a child, I never truly understood the reason nor the meaning of his absence, its duration or danger. So I kept coming back to this incident to try to better understand its significance and consequences, and I kept writing it from different perspectives to gain a greater range of insight into the situation, capturing it from different angles not so much to discover a common truth between the narrators, but to reveal the complexity of the situation in which these different people found themselves in. The stories are quite varied in form. There’s a flash piece, an epistolary story, a story that is presented as excerpted interview dialogue from a documentary. There’s a Borgesian essay about a fictional poet, a work of historical fiction from the early 20th century, and more standard contemporary realistic fiction. What drew you to so many different subgenres of short story? Since the content was sort of readymade, I had a lot more freedom with the form each story took, and the experimentation with form also added greater creativity to the expression of the content. The formal variation was inspired primarily by my reading at the time of writing the collection. For example, the epistolary story was influenced by the book The Correspondence of Paul Celan and Ilana Shmueli, while the excerpted interviews were influenced by my reading of Bolaño’s The Savage Detectives. The Borgesian essay was in fact inspired by Borges, as well as on the mock confessions and oblique biographies prevalent in the works of Nabokov and DaniloKiš. “A Brief History of the Southern Slavs” is such a wonderful opener. For those who haven’t read it, it’s just a half-page-long sentence giving (as its title suggests) cursory highlights from the history of the South Slavic peoples (i.e., Bosnians, Croats, Serbs, Slovenes, Montenegrins, Macedonians, and Bulgarians). What was the composition process of that piece like? Did it come very quickly, or were your laboring over it for a long time? Poetry—reading as well as writing it—has always had a stimulative effect on my fiction, and “A Brief History of the Southern Slavs”initially started out as a poem, structured as one long sentence, but then I found the line breaks I had imposed on the piece rather superficial so I turned it into a prose poem. Or flash fiction, if you please. (I’m sure there are readers out there who care strongly about correct terminology and distinctions of genre, but I really care only if you like what I’ve written, and if you do, you can call it whatever you want.) This is actually one of those rare pieces whose composition process was relatively quick and straightforward, springing from head to page in one elegant leap, all Athena-like, pretty much. Likewise, I very much enjoyed the final story, “The Exile of Muhamed Mehmedbašić.” It follows one of the men who took part in the Black Hand assassination of Archduke Franz Ferdinand, the incident that kicked of the First World War. What lead you to write about this relatively obscure figure? I consider “The Exile of Muhamed Mehmedbašić”the most ambitious story of the collection, so I’m extremely glad that you enjoyed it. I had two reasons for writing about Muhamed, the first being that I was working on a novel about the assassination of Archduke Franz Ferdinand, which occurred in Sarajevo, the capital of Bosnia and Herzegovina, a novel I have since abandoned, though will hopefully return to in the future, and had done a good deal of research about all the characters involved in the event. The second reason is that I was drawn to the fact that here was a Muslim Bosnian (Muhamed was born in Mostar, too) who was taking part in a revolutionary act that was far more pan-Serbian than pan-Slavic in nature (the rest of the assassins were all Bosnian Serbs). This may be a bitter truth, but the Muslims of Bosnia and Herzegovina were better served by the Austro-Hungarian regime than a Yugoslav (really Serb) one. (Indeed, between World War I and World War II, the newly-independent Kingdom of Yugoslavia was ruled by Serbian king.) What, then, made him take part? What drew him so inexorably to the false dawn of revolution? This question was my springboard into this story, which allowed me to reflect on my own identity as the offspring of a mixed union and allude to the terrible fate of Muslims during the recent war. One of the compelling things about this book is that it feels extremely personal and yet there’s also a great narrative distance to much of it. Sometimes the veneer of fiction feels wafer thin, and the reader senses that they are getting some really autobiographical material, and then at other times the layers of artifice pile up quite high. Like, you, Vedran, had nothing personally to do with the assassination of Franz Ferdinand, for example. But that’s in there, and it’s helping to tell your story, in a way. I’m always interested, in this age of ubiquitous memoir, in fiction writers who seem to be writing about this own lives while still using the medium of fiction. What is that balance like, for you? That’s an interesting question and one that’s difficult to answer because I feel the answer will keep changing with each new project. For this collection, I think it was my physical immediacy and intellectual distance to the personal parts of the war that created the emotional balance for writing about it. It’s a matter of proximity to the material, but it’s also a question of tone. But whether a story is based on total fact or pure invention—or, more likely, a combination of the two— imagination plays the largest role in shaping the narrative, including its tonal distance. Had I been closer to the events described, the tone of the stories would have perhaps been more personal and I may have been less inclined to heap so many layers of artifice on certain stories. Of course, in the end the narrative tone and style I utilize depends on how I intuit that each particular story wants to be told. Can you talk about your influences a bit? Aleksandar Hemon was the first writer that came to my mind—maybe that’s a lazy comparison—but by the end the book that this reminded me of the most was Junot Diaz’s collection Drown. What were you reading when putting this together? I have actually read very little of Aleksandar Hemon (though I enjoyed immensely the little I’ve read). In fact, the only ex-Yugoslav writer I have read extensively is Danilo Kiš, who was a huge influence on this collection and whom I mention in “Witness to a Prayer,” a story about the creative process and artistic influence as much as exile and death. But I did read Drownfor the first time during my MFA, when I started working on most of the stories in the collection, and am incredibly flattered by the comparison. [Note: this interview was conducted before the May 4th accusations against Diaz.] Other major influences include the aforementioned trio of Nabokov, Bolañoand Borges,along with Stuart Dybek and Isaac Babel, and also the life-changing poetry of Paul Celan (and his letters). I just recently finished and am now polishing up a novel that’s quite a departure from the content, though not themes, examined in this book. In brief, the novel is set in Los Angeles and told in the form of “diary” entries the narrator writes, addressed to his wife’s psychiatrist, in which he admits to his violent sexual fantasies, while in the backdrop a serial killer of young women is on the loose.